Have you wanted to create a movie theater like room in your house for several years? 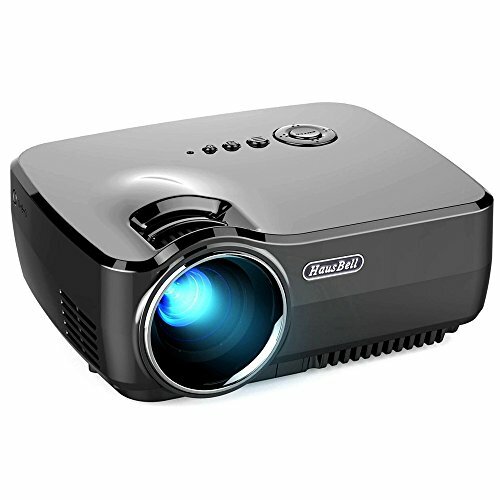 Have you need a projector that is easy to carry and can be use everywhere? Hausbell Mini Portable Video LED Projector is a great choice for you. This mini project overall is incredibly versatile, and is ready to plug and go with pretty much all everyday media sources. The lens can be focused and has a keystone to tilt to make image more square. The menu is a very elaborate one where you can adjust the color, contrast, sharpness etc. to your likings. You can listen to music, look at your pictures, watch a movie, play your video games through your console and even read an e-book. It has a pretty good sounding built in speaker or if you want to be quiet there is a headphone jack on the side of the projector as well. 1. Special Cords is required if you connect the projector to tablets and smart phones. 2. External Speaker required if you use a VGA cord to connect the micro projector while watching videos, VGA cable can NOT transmit audio signal. 3. As with any projector, they tend to get hot, and so good ventilation is key to getting the longest life out of the device. 4. When the projectors works, the fan will make noise to radiating due to the highly temperature. It will be better that you can have a break after 3 to 4 hours using to avoid overheating. 5. The remote only works when you aim it at the back of the projector in range of 2m. If you're sitting behind it but if you have it against a wall, you can place a tiny little mirror behind it so it reflects the remotes IR into the IR receiver. 6. If you connect the projector to your tablets via HDMI cable and want to play videos, we recommend you to set up the projector to HDMI input. Portable and versatile: ultra lightweight to move it to a different room or even throw in a backpack; Equipped with HDMI/USB/AV/SD/VGA interface, easy to connect with PlayStation PS3/PS4, WII or XBOX, PC, laptop. If you have any questions about this product by Hausbell, contact us by completing and submitting the form below. If you are looking for a specif part number, please include it with your message.